Tomorrow, 7 January, is the deadline for paying your 2015 Local Property Tax (LPT) bill for 2015. Tomorrow is also the deadline if you wish to commit to pay your LPT by automatic debit from your bank account, or Single Debit Authority. Under this method, your payment will be deducted from your bank account on 21 March 2015. 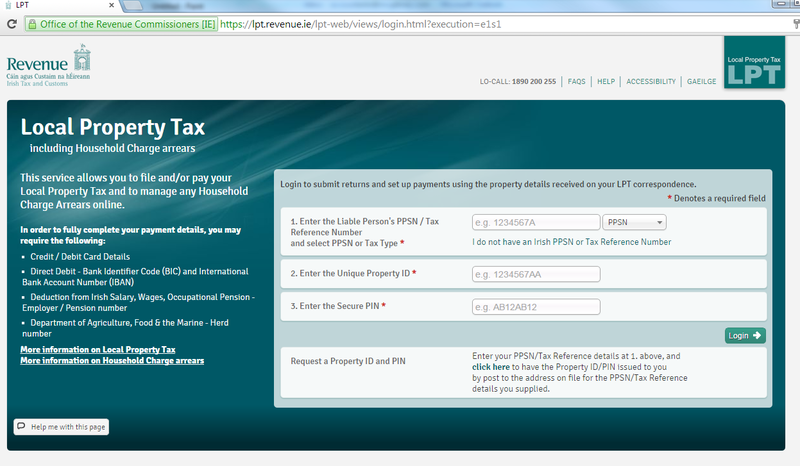 The simplest and easiest way to pay your LPT is online. To do this, you will need your PPS number, along with your Property ID and PIN. You can locate your Property ID and PIN on the LPT reminder you should have received from Revenue in October, or on your LPT records from last year. Once you’ve logged in, the process of paying your LPT is very straightforward, and should take you no longer than 5 minutes. The deadline for paying LPT on a phased basis for 2015 has now passed, and this option is no longer available. The Revenue website contains a wealth of information and advice on all aspects of Local Property Tax.